If you’ve seen the latest Tom Cruise Mission: Impossible adventure, Fallout, there are two things you can’t miss: Cruise’s amazing stunts and Lorne Balfe’s musical score. Balfe utilizes Lalo Schifrin’s classic Mission themes in practically every scene. He wrote approximately four hours of music for the film and it took an entire month to record in London, as the composer told me for this Variety story about his nine-month odyssey to create the music with director Christopher McQuarrie (and a little help from Cruise). The Variety piece also includes a wonderful three-minute video shot during the London recordings. 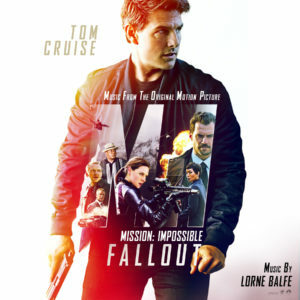 This entry was posted in Composers, Film Music, Interviews and tagged Fallout, Lalo Schifrin, Lorne Balfe, Mission: Impossible, Mission: Impossible music, Tom Cruise music, Variety on July 27, 2018 by Jon Burlingame.